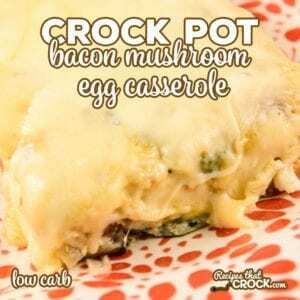 Crock Pot Bacon Mushroom Egg Casserole - Recipes That Crock! 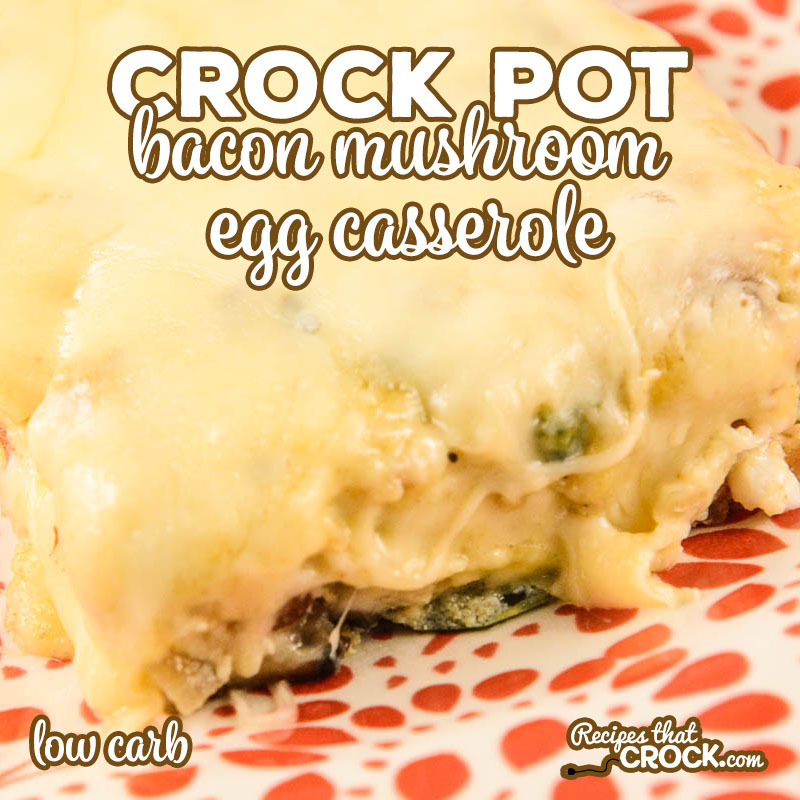 Our Crock Pot Bacon Mushroom Egg Casserole is a savory breakfast recipe with onion, peppers smoky cumin and creamy Havarti cheese. This dish is perfect for breakfast, brunch or even breakfast for dinner. You guys know I LOVE me a good breakfast egg casserole… especially low carb breakfast casseroles. 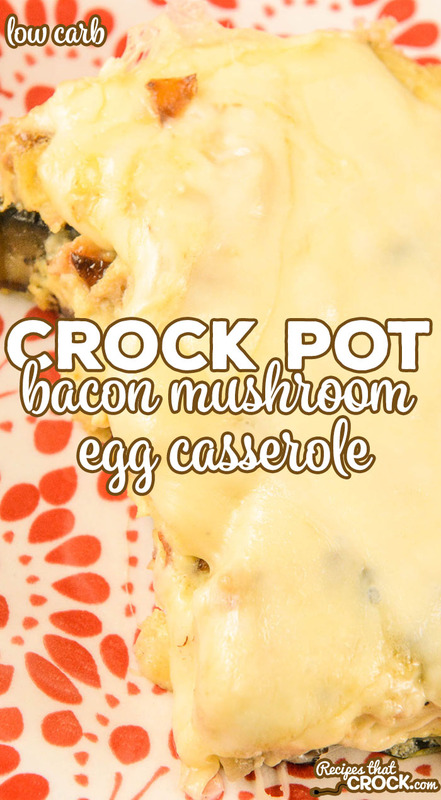 This Crock Pot Bacon Mushroom Egg Casserole is such a great addition to our menu because it has such a unique savory flavor that is perfect for brunch or brupper/brinner (breakfast for supper/dinner). I can’t wait for you guys to try this one! Check out our Recipe Finder for a full list of our low carb breakfast recipes. Below are a few of our favorites. We make this breakfast casserole in our 6 quart Ninja Slow Cooker because we love the ability to saute the mushrooms and slow cook in the same pot. You can use a traditional slow cooker if you would like and use a skillet on the stove for the saute step instead. See our Recipe Finder for a full list of our low carb breakfast recipes. Finally, all slow cookers cook differently, so cooking times are always a basic guideline. Recipes should always be tested first in your own slow cooker and time adjusted as needed. Saute mushrooms, onion and peppers with 1/4 cup of butter in a skillet or browning slow cooker. In a bowl, beat eggs and stir in cream, cumin, salt, pepper, garlic, crumbled bacon, mozzarella cheese and 2 slices of the Havarti cheese (crumbled). If using a traditional slow cooker, coat with butter (browning slow cookers will already be buttered from the saute step). Stir the mushroom mixture into the egg mixture and pour into the slow cooker. Cook on high until eggs set (45 minutes to 3 hours - cooking time will vary greatly depending on how hot your slow cooker cooks). Cover eggs with Havarti Cheese and cook for 5 more minutes to melt the cheese. This receipe sounds delicious. Can I freeze the left overs for another meal? I haven’t tried freezing egg casseroles before, so I am not sure how it would do. If you try it, let me know how it goes. Enjoy! 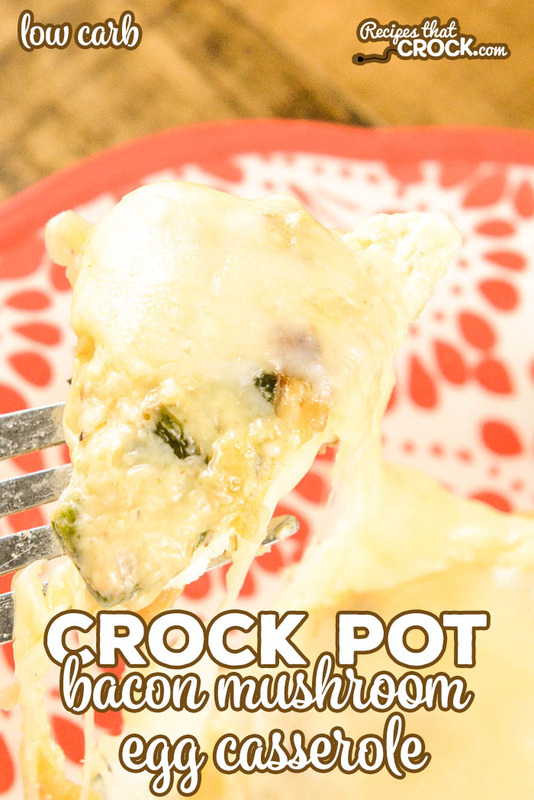 Would this recipe fit in a 3.5 quart cassrole slow cooker? It will definitely fit, however you may find that the eggs do not rise as much in the casserole crock. Enjoy!